Most people know oysters have a hard outer shell and live on the bottom of Texas bays and estuaries. But what many people don’t know is that oysters don’t start out in a shell. After hatching from tiny eggs, the soft oysters drift in the water, pulled along by currents in the bay for about three weeks. They then find a hard surface upon which to attach. Once attached, they begin growing their shells. Oysters in Texas mostly grow on the shells of other oysters, forming an oyster reef over time. When oysters are harvested for food the whole animal, shell and all, is removed. The soft oysters are removed from the shells when prepared as food in restaurants and by seafood processors. Where do all the shells go? A great class project is to help restore these oyster shells to oyster reefs so new oysters will have a place to attach and grow. This is called oyster shell recycling. In cooperation with Texas Parks and Wildlife biologists, oyster shell is returned to oyster reefs to keep the reef healthy and supply oysters for the future. Without recycling, the shells will be thrown away and the oyster reef will not be able to regenerate new oysters. 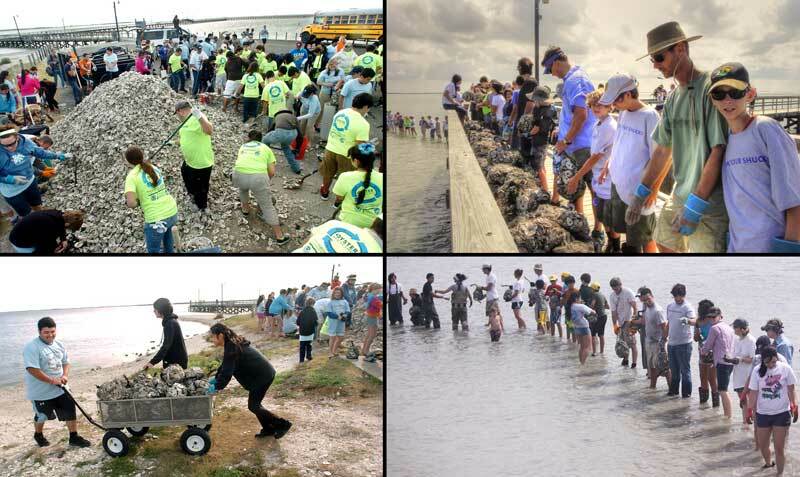 In the photos below, high school students volunteer in a “Sink Your Shucks” oyster shell recycling program sponsored by the Harte Research Institute at Texas A&M University-Corpus Christi. Restaurants supply the shucks.